I have complied with the law in regard to obtaining information about my biological parents. I hired a Search Specialist, Laura Long, in 2011. She submitted to you a report stating that my bio. parents are deceased. You sent me a letter on June 6, 2011 stating that my biological parents are deceased. 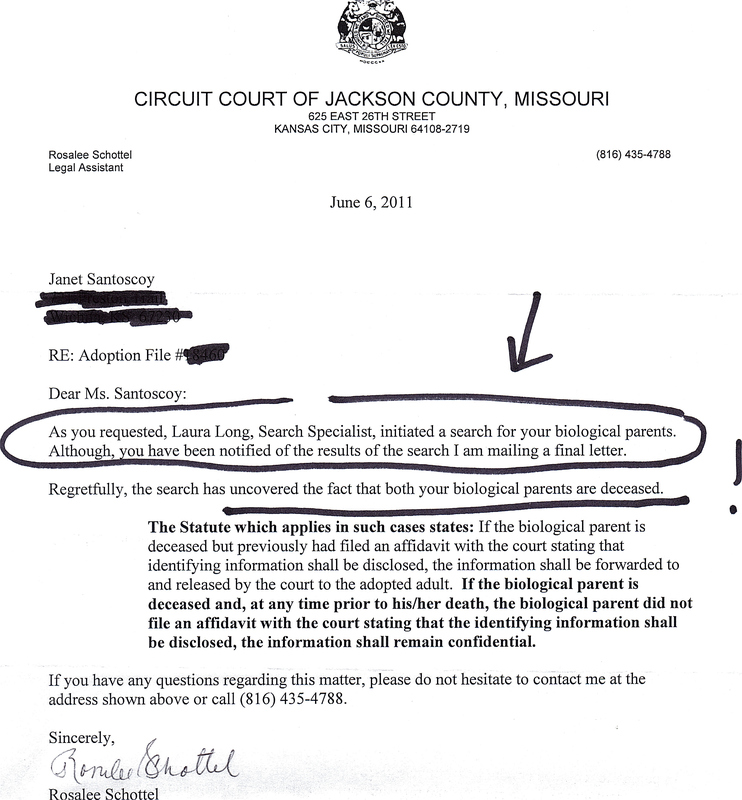 From your letter — “Regretfully, the search has uncovered the fact that both your biological parents are deceased.” Are you saying that you no longer believe in the contents of your letter? Obviously something is wrong with the system of the Circuit Court of Jackson County, Missouri. I have a right to obtain the identifying information about my biological parents and I feel that you are denying me access. I have sent you the form requesting information, a photo copy of my driver’s license and proof of my adoption. I have also sent copies of my bio. mother’s birth and death certificates. And now you want the original records. What will you want next? I am a 61 year old adoptee whose biological and adopted parents are deceased. Are you hoping that I will also die before you have to send me information on myself? In my case, both of my biological parents are deceased. I even went to the extent of hiring a Court Search Specialist to try and find them. She reported back to Rosalee Schottel of the Family Court Division of the Circuit Court of Jackson County, Missouri that my bio. parents are deceased. So — under the new law, not the law quoted above — I have tried to obtain my sealed records from the State of Missouri and Ms. Schottel has continued to stand in the way. Even though she previously informed me that my parents are dead, now she wants original documents proving that they are dead. I don’t understand why I even have to send her anything as she had previously written me to inform me of their deaths. I don’t know what I am missing here, but there is a disconnect between Ms. Schottel’s office and the Senator’s legislation. I have forwarded a complaint about this to Senator Lamping, who sponsored the new bill and I am waiting to see if anything happens. And I’ve also sent a complaint to Ms. Schottel.